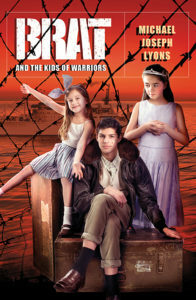 Brat is the first in a series of at least four novels about U.S. military brats. The first book Brat: Kids of Warriors, by Amazon Best Selling Author Michael Joseph Lyons, centers on Army brat Jack McMasters, a reluctant hero who arrives in post-war Germany when his dad gets stationed with 4thArmored division on the free side of the Iron Curtain. It’s 1957 and Jack soaks up war stories he overhears about WW II. I am a military brat—and I say that with great pride. My sisters and I went traipsing all over the world with my father and mother; he, a United States Army colonel; she, the general in charge of our family.